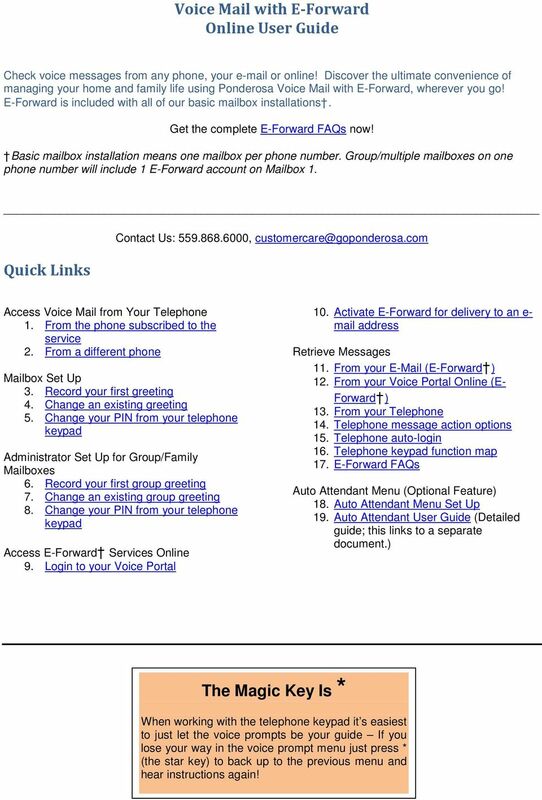 Download "Voice Mail with E-Forward Online User Guide"
1 Voice Mail with E-Forward Online User Guide Check voice messages from any phone, your or online! Discover the ultimate convenience of managing your home and family life using Ponderosa Voice Mail with E-Forward, wherever you go! E-Forward is included with all of our basic mailbox installations. Get the complete E-Forward FAQs now! Basic mailbox installation means one mailbox per phone number. Group/multiple mailboxes on one phone number will include 1 E-Forward account on Mailbox 1. Quick Links Contact Us: , Access Voice Mail from Your Telephone 1. From the phone subscribed to the service 2. From a different phone Mailbox Set Up 3. Record your first greeting 4. Change an existing greeting 5. Change your PIN from your telephone keypad Administrator Set Up for Group/Family Mailboxes 6. Record your first group greeting 7. Change an existing group greeting 8. Change your PIN from your telephone keypad Access E-Forward Services Online 9. Login to your Voice Portal 10. Activate E-Forward for delivery to an e- mail address Retrieve Messages 11. From your (E-Forward ) 12. From your Voice Portal Online (E- Forward ) 13. From your Telephone 14. 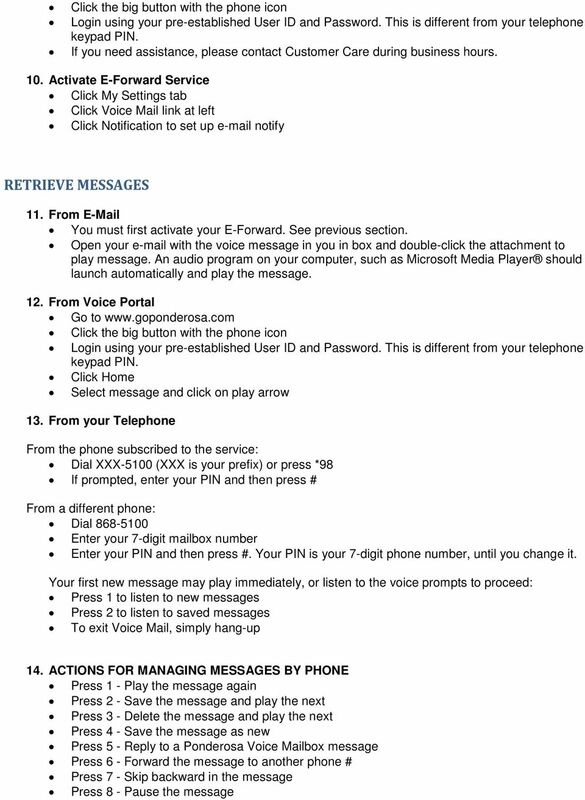 Telephone message action options 15. Telephone auto-login 16. 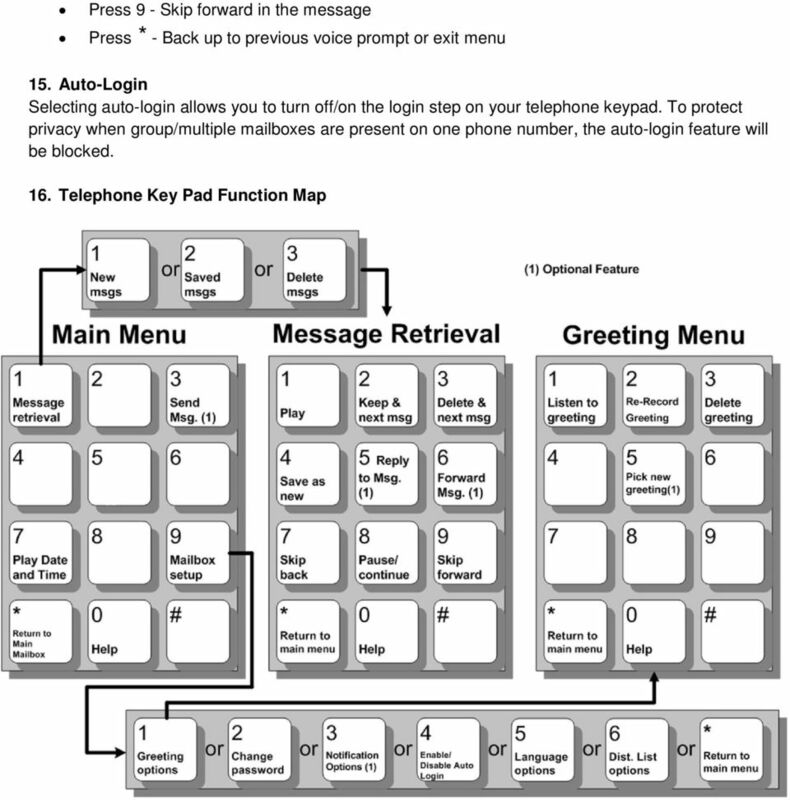 Telephone keypad function map 17. E-Forward FAQs Auto Attendant Menu (Optional Feature) 18. Auto Attendant Menu Set Up 19. Auto Attendant User Guide (Detailed guide; this links to a separate document.) The Magic Key Is * When working with the telephone keypad it s easiest to just let the voice prompts be your guide If you lose your way in the voice prompt menu just press * (the star key) to back up to the previous menu and hear instructions again! 6 17. E-FORWARD FAQS Quick Links 1. What is E-Forward? 2. Login to the Web Portal 3. Voice Message Handling 4. Web Portal User ID & Password 5. Reset Password 6. Set-up Notification (E-Forward) Options 7. Greeting & Scheduling Options 8. Upload a Greeting 9. Distribution Lists 10. Device Requirements 1. What is E-Forward? E-Forward is Ponderosa s integrated messaging Internet companion, included with your telephone Voice Mail service at no additional charge. 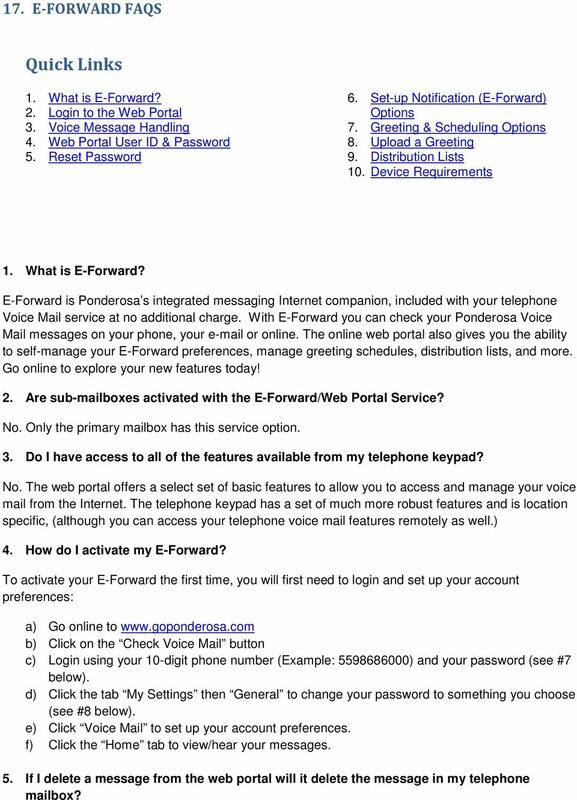 With E-Forward you can check your Ponderosa Voice Mail messages on your phone, your or online. The online web portal also gives you the ability to self-manage your E-Forward preferences, manage greeting schedules, distribution lists, and more. Go online to explore your new features today! 2. Are sub-mailboxes activated with the E-Forward/Web Portal Service? No. Only the primary mailbox has this service option. 3. Do I have access to all of the features available from my telephone keypad? No. The web portal offers a select set of basic features to allow you to access and manage your voice mail from the Internet. The telephone keypad has a set of much more robust features and is location specific, (although you can access your telephone voice mail features remotely as well.) 4. How do I activate my E-Forward? To activate your E-Forward the first time, you will first need to login and set up your account preferences: a) Go online to b) Click on the Check Voice Mail button c) Login using your 10-digit phone number (Example: ) and your password (see #7 below). d) Click the tab My Settings then General to change your password to something you choose (see #8 below). e) Click Voice Mail to set up your account preferences. f) Click the Home tab to view/hear your messages. 5. If I delete a message from the web portal will it delete the message in my telephone mailbox? 7 Yes, deleting from the telephone or from the web portal will delete the other copies, except from e- mail. 6. If I delete the message from my will it delete copies on the web portal or my telephone? No. 7. What is my user ID? User ID is your phone number. Enter it like this: What is my password? A password was supplied to existing customers with the letter communication about this enhancement. New customers will establish their password when they place their subscription. A password can be a maximum of 20 characters alpha numeric only. We recommend at least 10 characters with at least one capital letter and 1 numeral for security reasons. 9. Forgot your password? Call Customer Care during business hours to reset the password. 10. 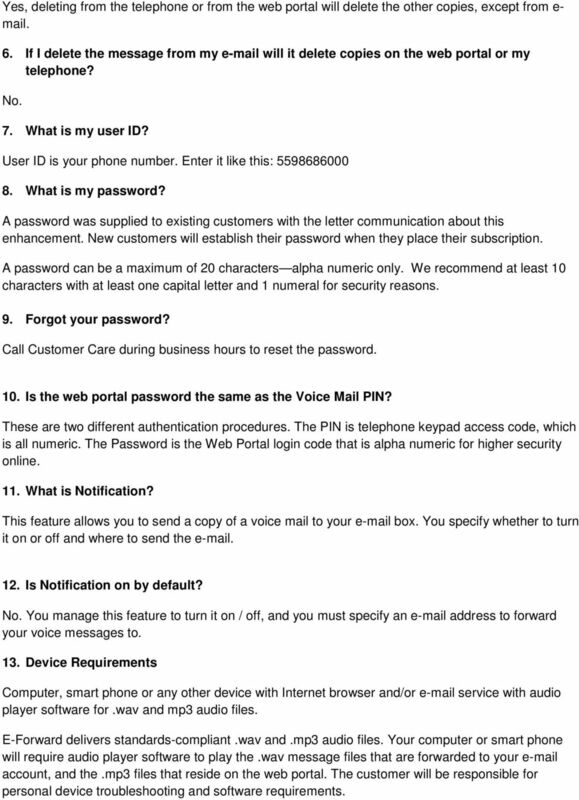 Is the web portal password the same as the Voice Mail PIN? These are two different authentication procedures. The PIN is telephone keypad access code, which is all numeric. The Password is the Web Portal login code that is alpha numeric for higher security online. 11. What is Notification? This feature allows you to send a copy of a voice mail to your box. You specify whether to turn it on or off and where to send the Is Notification on by default? No. You manage this feature to turn it on / off, and you must specify an address to forward your voice messages to. 13. Device Requirements Computer, smart phone or any other device with Internet browser and/or service with audio player software for.wav and mp3 audio files. E-Forward delivers standards-compliant.wav and.mp3 audio files. Your computer or smart phone will require audio player software to play the.wav message files that are forwarded to your account, and the.mp3 files that reside on the web portal. The customer will be responsible for personal device troubleshooting and software requirements. 8 14. I cannot launch the audio file attachment to hear the message. What do I do? These applications are typically included in most current computers and will launch automatically when you double click the file. You may need to install a media player, such as Microsoft Media Player or other free-ware applications available online, that can play audio files. 15. What is an address? It is a phone number or mailbox number. Enter addresses like this: What is the Greetings window for? This shows the list of recorded greetings available with management options to create, edit, delete or select a greeting. 17. How can I record and upload a new greeting directly to the web portal? First you need to login to the web portal and make sure you have turned E-Forward ON and entered your address. From your designated phone number, login to your Voice Mail box. Press (*) for the main menu. Select (3) send a message. Enter your own 10-digit mailbox number; press ##. Record your greeting and send it. From a different phone number, place a call to your phone with the voice mail service. Leave a message as the greeting you wish to record. When the E-Forward arrives in your , listen to your greeting to be sure it is the right one, then download the.wav file to your computer. Once you are in the web portal, go to My Settings/select Voic at the left/scroll in window to Greetings. Click the arrow to open the window, then click the green and white plus button to add greeting. Click the ( ) box and browse to where you stored the.wave file on your computer. Double click the file to upload it. Name the file and click save. Select the greeting you wish to play by highlighting it and clicking the ( ) Make Greeting Active Click Save at bottom of page. 18. What is Greetings/Schedule? Here you can schedule certain greetings for times of day 19. What are Greetings/Specific Events? Here you can schedule specific date and time events greetings such as holidays or special occasions 20. What are Greetings/Callers? 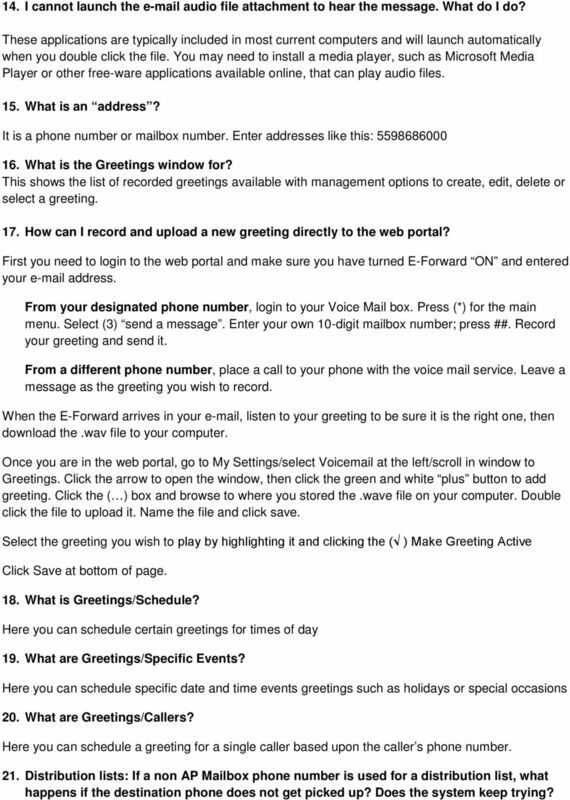 Here you can schedule a greeting for a single caller based upon the caller s phone number. 21. Distribution lists: If a non AP Mailbox phone number is used for a distribution list, what happens if the destination phone does not get picked up? Does the system keep trying? 9 It will place 1 call to the number and play the message 3 times if it receives answer. An answer could be an answering machine, voic system or somebody picking up the phone. 22. If a toll-generating phone number is used for a distribution list, what happens? Voice Mail will not dial toll numbers unless you request from Ponderosa that an account be established for toll billing for this feature. 18. AUTO-ATTENDANT MENU TREE SET UP You can configure Auto Attendant to play a message, forward the call to a specific number or instruct callers to dial a party by name or by extension. 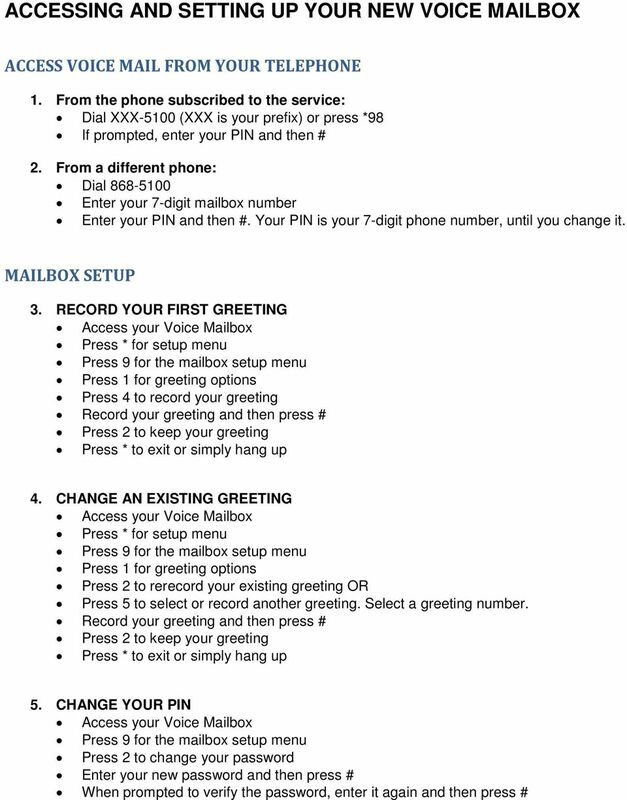 IMPORTANT: If your primary auto-attendant greeting is not prerecorded, the system will not answer and route your calls until you complete the set up instruction below. 1. Find a quiet place to make your recordings and a person to record your auto attendant greetings. Have your greeting scripts at hand. 2. Dial to access the Auto-Attendant login. 3. Enter your main access number as a 7-digit telephone number, (number assigned to Auto Attendant). 4. Your default password is (provided by Ponderosa) until you change it. 5. Follow voice prompts for Auto Attendant set-up. a. Prepare your greeting script before you begin. 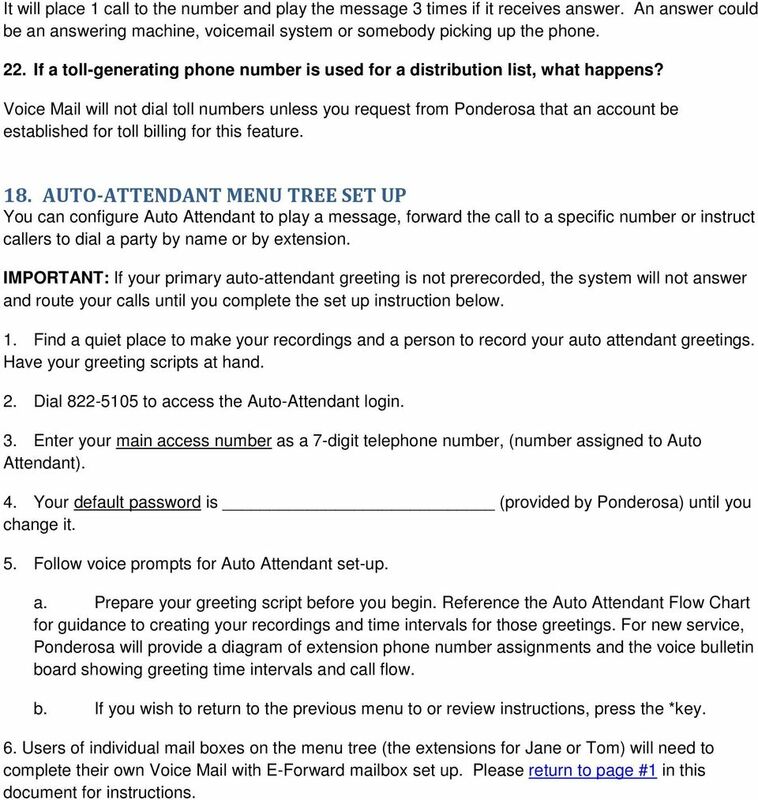 Reference the Auto Attendant Flow Chart for guidance to creating your recordings and time intervals for those greetings. For new service, Ponderosa will provide a diagram of extension phone number assignments and the voice bulletin board showing greeting time intervals and call flow. b. If you wish to return to the previous menu to or review instructions, press the *key. 6. 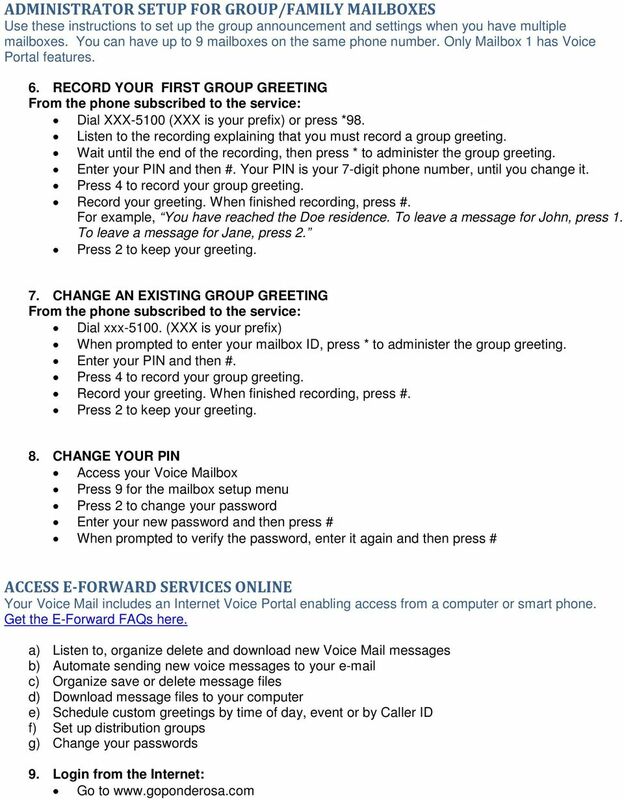 Users of individual mail boxes on the menu tree (the extensions for Jane or Tom) will need to complete their own Voice Mail with E-Forward mailbox set up. Please return to page #1 in this document for instructions. Our unique Management portal makes setting up and maintaining your phone system easy, and with just a click of a button. Audience This document is intended for current students, faculty, and staff who use Colgate University s campus voicemail system. Virtual Receptionist Manual This manual is meant to be a guide to help you set up your PhoneFusion One Virtual Receptionist phone number, and some tips and shortcuts for some of your favorite features. Hosted Voice Business Group Administrator Quick Start Guide 2 Get Started with EarthLink! This easy-to-use guide consists of a series of brief instructions designed to help you configure your new service.